A lot more time was spent in spreadsheets this week. Trying to find out what makes each of the 60 ponies special and how they can all compete with each other in tier-free combat. I also fleshed out the items list for the game and got to pick out some finalized names and mechanics. Doing all this stuff gets me in a warm and fuzzy gamedev mood. Check out what got done this week! Updated the roster posters and made templates out of them. Detailed schedule for my Capstone project. Adding augments on top of everything else is just going too far. Writing each ability and item's details made me realize how redundant (and off balance) they are. Coding each move and ability is going to eat quite a few months of development. With a bunch of templates and rules, it should go faster. Making this pipeline is a priority. 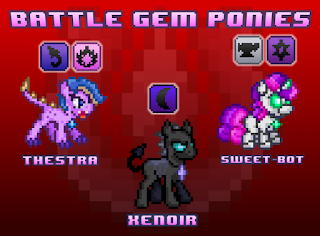 I'll need more original ponies to balance out the homages. 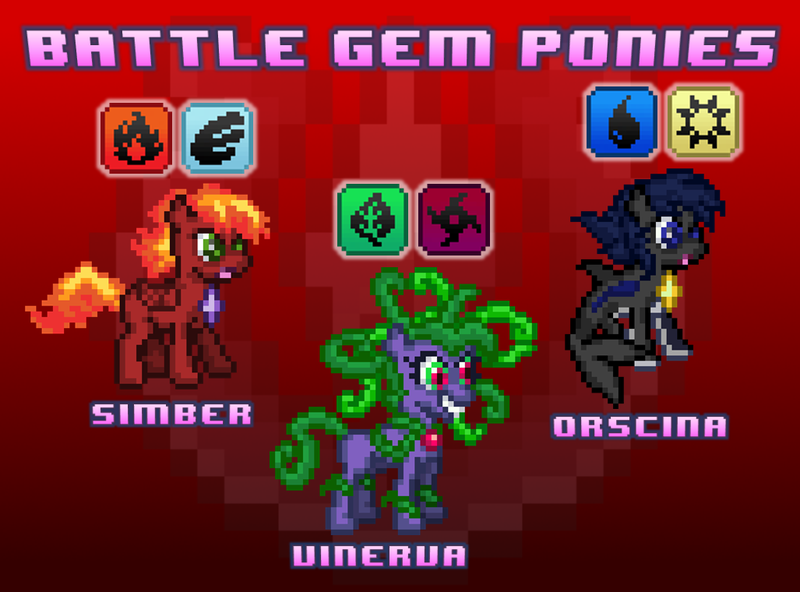 I want to give love to the pony characters that made this idea so exciting to me in the first place, but I also want to create lovable BGP characters that broaden the scope of what a Battle Gem Pony can be. There will be a bigger post on this later, but I'm shrinking the scope a bit further as far as combat mechanics and collectibles go. I planned on scattering augment meteorite shards and chroma scales across the overworld to reward exploration and poking around, but integrating gem augments with the combat and chroma scales with the sprites is just adding too much to my already sky-high workload. Abilities and battle items already do what augments would do with the only difference being augments acting as unique, consumable battle items for each pony form. Explaining the mechanic to the player as well as making all the interfaces to interact with it is just not essential (at least for this first game). I put that mechanic aside and into my sequel ideas document. The other dropped idea of chroma scales is a hard one that I'm still teetering on actually. 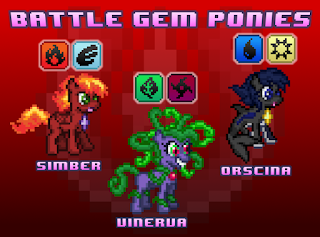 Basically, like Pokemon's shinies, every pony has a rare palette swap. 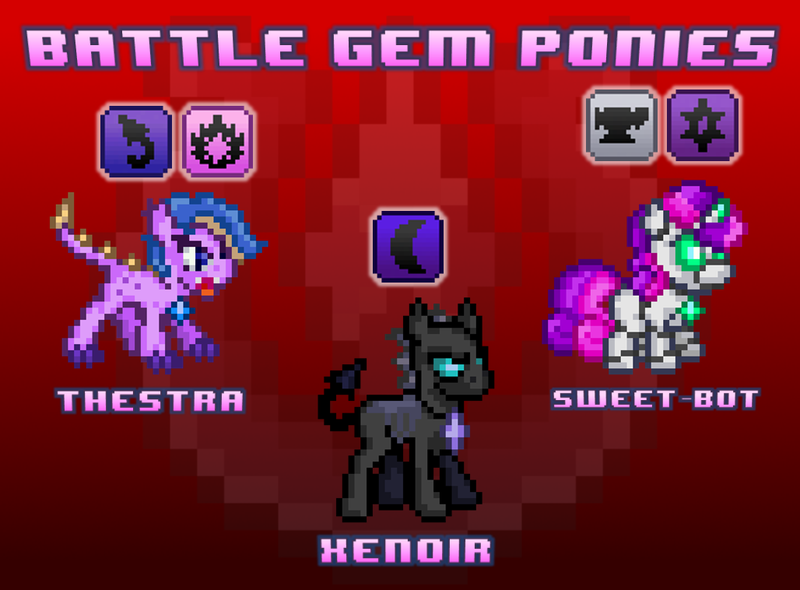 This color change is activated by using consumable items called chroma stones on your pony. These things are supposed to be as valuable as Pokemon's Rare Candy to make up for the lack of a level boosting overworld item (unnecessary since you only have one pony EXP bar to raise). Changing sprite colors would be as simple as choosing a new palette and replacing the old colors with Gimp. 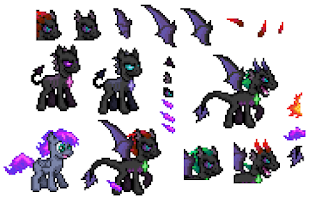 Technical problems with the plan include dealing with twice as many pony sprites and animations in memory. I feel like if I hold off on this idea until a second game, it'll give me time to come up with an efficient way to do this as well as give me something exciting to talk about before the sequel's release. I readjusted some project scope estimates and found out that Pre-Alpha Demo V4 (the core gameplay features) should be done before Christmas, assuming a month's worth of setbacks. After that development will mostly be shaping up the story, world, and exact layout before half a year of animating, playtesting, and balancing. New player count is steady as ever. Lots of activity on Twitter this week as well as some YouTube milestones. 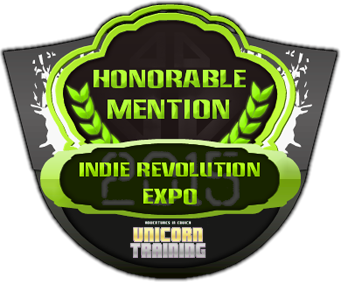 I reached 15,000 views on the Unicorn Training Trailer, which becomes 16,500 when combined with the iOS version. I also met someone last week who's daughter really loves Unicorn Training and that made me smile pretty wide. My goal of putting eyeballs on my work is going great! Keep an eye out this week for the next pony set reveal. It'll be a nice thematic compliment to the set shown off on Friday. The tiny sprite details change so frequently that they're already out of date, but the information in the post still stands and the WIP sprites aren't too far off from the current versions. Hope you'll come back to look at some new show-inspired ponies.